K smiled and chuckled as I played this interview with Peter Sculthopre (1929 - 2014) where he speaks about being reprimanded as a child for daring to compose because all the composers were dead. Now he is dead. "That's just how he was. Warm, quite dry, and really lovely. He liked a good curry" They had met in the 70s, and K would house sit when he travelled. In a spooky ever closing loop, Sculthorpe then lived in a tiny terrace house, which he described as a decorated passageway, immediately next door and identical to where we now live in Sydney. It was a time when Peter was increasingly attracted to the east and Shinto, although Australia, its landscape and ancient inhabitants would always be his inspiration. He told the story of being in Oxford and the suggestion: 'you must like it here, it's quite old' to which he said: 'well, you should come to Australia where it's really really old'. The recurring theme of all the obits is he was the first to show us the landscape musically through our own (he was says his) ears. I'd say rather like a musical Fred Williams, whom I'm equally mad about, if you like that kind of analogy, which I don't. Of his own admission, his work became increasingly political and environmental as the impending planetary crises became ever more pressing. The first Sculthorpe I remember was his opera "Rites of Passage" which I now read was commissioned but not ready for the opening of the Sydney Opera House where War and Peace did the job instead. About all I recall were dancers running frantically across metal sheets making percussion. It was the early 70s, and in retrospect a time which increasingly looks to have be a free-wheeling whirl of creativity and exploration with the likes of Peter Maxwell-Davies Miss Dunnithorne's Maggot and whoever whatever filling the house. Nowadays, if it isn't Boheme, no one wants to know. "My main influences these days are to do with the environment and climate change. It has its seeds in a work like Earth Cry from 1986 in which I was saying we should listen to the cry of the earth as the Aborigines have done for many of thousand of years. Then maybe we'll get the country right. Later in a work like Memento Mori I used Easter Island as a parable for planet Earth and population growth. The way they chopped down all the trees and ended up cannibalising each other. Couldn't even make canoes to escape the island"
His relationship with the SSO was strong. In tribute, the SSO dedicates this week's performances (Brahms Second Symphony and Strauss Four Last Songs, Robertson / Brewer) to his memory and will play his Momento Mori as an encore. Andrew Ford's (ABC The Music Show) well informed remembrances of Peter Sculthorpe are here from Inside Story. One is starting to get the sense that he didn't set out to create Australian music, or music which reflected Australian-ness, but rather he composed what was within him, and that necessarily was of this place. That said, he did write Kakadu before going there, imagining it, and was later surprised by its reality. 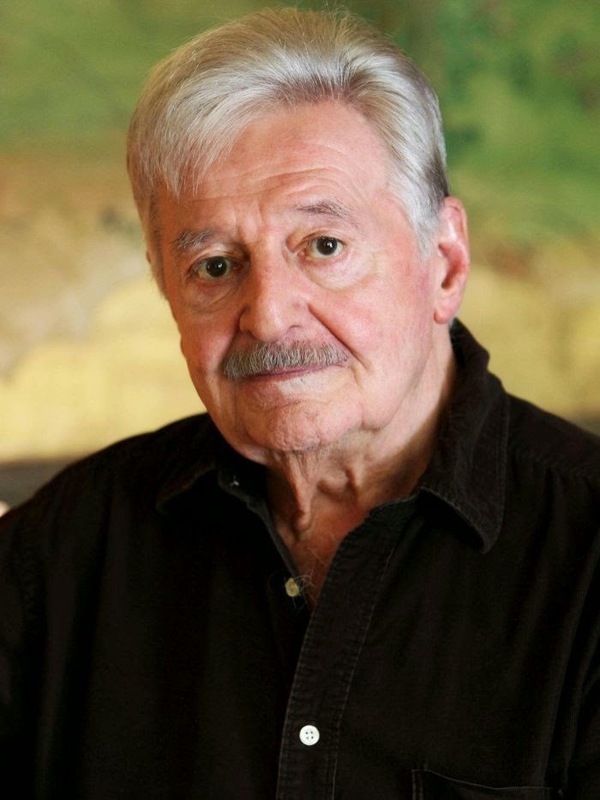 And The Music Show segment on Peter Sculthorpe is podcast here. The first piece I ever heard of his was the recording by the Allegri Quartet of his Radcliffe Award-winning 'String Quartet Music' of 1969. Played it again (three times) yesterday, along with others of his quartet legacy. Hope to see you both in Sydney. In honesty, I liked him for too afar but will make amends. Have to admit only knowing one or two of Sculthorpe's pieces - but I do remember 'Ketjak' played by a youth orchestra (Scottish?) at the Edinburgh Festival in the 1980s, 'violins zinging like electric wires' would be a near self-quotation, I think. Meanwhile we are stuck with your Brett Dean, nice and talented man, I'm sure, but oh how dreary were his Electric Preludes at the Proms this week. One kept waiting for the foreground to start up. Ed Seckerson hit the nail on the head - probably OK for film mood music, like so many contemporary works. Unfortunately someone - I think I know whom - at the BBC Symphony Orchestra has taken a huge shine to him, so plenty of Deanery next season. Yesterday, when I learned Peter Sculthorpe had died, I looked in here to see if you might write something, and now, here you are, with such a wonderful, personal, and personable post (along with so many good links). I knew nothing of Sculthorpe until I met Welsh composer John Metcalf, who, among other things is artistic director of the Vale of Glamorgan Festival of Contemporary Music. John was hesitant to direct my exploration in any way, in a desire to encourage me to follow my own nose, as he put it, but when I pressed for suggestions, he mildly said, "You might like Peter Sculthorpe." Oh, how right he was—I then proceeded to buy every CD of Sculthorpe's work I could lay my hands on and played favorite pieces over and over again. More recently, I friend alerted me to chamber music of his I hadn't happened upon before, so that set me on another trail. Yesterday, Memento Mori was among the beautiful pieces of his I reached to play, in remembrance of all the wonderful music he's left to us. Another piece I come back to in certain moments, always with pleasure, though perhaps not characteristic of his work, is My Country Childhood. So sweetly pastoral, that one. Well, anyway, I'm so sorry he's not with us anymore, but all the more grateful to have his music, as well as this post of lovely memories from you. Susan, you put me to shame. I have, however, desperate to catch up, played some of his string quartets this past weekend, and will stay with him this week. It is perhaps a case of taking for granted, an antipodean trait not to be proud of. Thank you for your lovely long comment, genuinely felt. I will search out My Country Childhood (his was in Tasmania; my early years were country too) for sweet pastoral has well pricked my curiosity. If composers are to survive in the musical memory, it seems to me that they need works that are regularly performed, even through the years of neglect. Elgar had his Enigma Variations. Grainger his Country Gardens and others. I wonder what of PS will live on? Maybe his quartets? It's hard to say Roger. Sun Music and Kakadu are arguably his most well known to the 'common' man. There are fashions at play also. Searching the Sydney Symphony website he is not listed under 'composers', a search which relates to the current season I assume (Dean is there). You will hear him this week in a tribute though. The ACO is a huge supporter of Australian Music with performances and commissions, including PS whose Lament for Strings was one, and is the ACO's most performed Sculthorpe work. Details here. I can't speak for the other states but we live with philistine governments and the risk is the importance of someone like PC is professed at the time of his death only to be sidelined by mainstream programmers dependent on bums-on-seats for revenue. By way of example, Opera Australia's season next year is mostly popular classics along with about 120 performances of "Anything Goes". And think of Patrick White - a giant of a man and literature - and while not forgotten he has slipped of the curriculum as far as I know (I hope I'm wrong), popping up in the theatre occasionally but book clubs? wanderer: I think of you as I, too, listen to Sculthorpe this week. Though I'm sad for the reason, I'm very glad to be brought back to his work. If you don't have it, I recommend the 2 CD set Requiem. David: If you should happen this way again, I hope you will also try out the 2 CD set Requiem. Sculthorpe is everything I hope for in a composer. Beauty, intelligence, and deeply felt communication that speaks of, yet transcends, his own time and place. Said with such feeling. I'm listening now, although I could do with a better (more still) context. A couple of more worthwhile links have been added above. Andrew Ford's notes are well worth a read. I'll hear the Momento Mori in concert this Friday night. Ford's notes are wonderful. I had found the 1999 interview and listened with pleasure. These two things add quite a bit of context for thinking about Sculthorpe and his work, don't you think? Curious that he was a monarchist, I must say!